Swindon scored first with a shorthanded goal against the run of the play so far at 3.41 before going on to concede a 5 on 3 advantage, in between the shorthanded goal and the 5 on 3 advantage Kamil Tvrdek finished from Sam Waller for 1-1 at 6.06. The 5 on 3 was killed off and at 13.51 Aaron Nell netted for the visitors making it 1-2. The home team enjoyed a near double shot advantage but it was the 1-2 scoreline that remained at the interval. Two quick goals from Swindon at the start of the second period boosted their cause. Aku Pekkarinen scored the game winner at 22.31 and Sam Bullas made it 1-4 with a powerplay goal at 24.19. Stephen Balmer netted unassisted at 31.19 with what would turn out the final Slough goal of the season to keep the game alive. At 35.53 Bullas again scored with the man advantage and was followed at 35.41 by Sam Smith. With 43 seconds left in the period Adam Harding scored for 2-7. Swindon enjoyed their position of power in the final period but Slough failed to give up. Some good passing and good moves were foiled by some good goaltending by back up Michael Crisp who played the final period and kept the sheet clean. Harding netted his second at 53.53 to complete the scoring at 2-8. Following the game Slough Jets Head Coach Craig Moran collected the home man of the match award on behalf of himself and his whole team while Aku Pekkarinen scooped the visitor’s award. Slough Jets final league battle of the season was at the Spectrum against the Guildford Flames and the visitors took the opportunity to start Danny Milton in net. Neil Liddiard but the home team ahead after just 62 seconds but Pavel Gomeniuk pulled the game level 22 seconds later before Dan Rose scored at 15.54 to make it 1-2 and 4.06 later the first period ended with Slough still holding the 1 goal lead. Guildford changed to James Hadfield in net at the start of the second period and levelled up the game early into the middle period when Branislav Kvetan converted a powerplay at 22.49 but his was the only goal of the period and the middle twenty minutes ended tied at 2-2. Frantisek Bakrlik started the third period well for Slough with the go ahead goal at 47.18 but Dean Holland equalised at 48.31 and then Nathan Rempel put Guildford ahead for the first time in the game at 50.35 but the visitors weren’t finished yet. Captain Michael Wales scored the equaliser at 53.41 before Gomeniuk netted his second, and the game winning goal at 54.01. 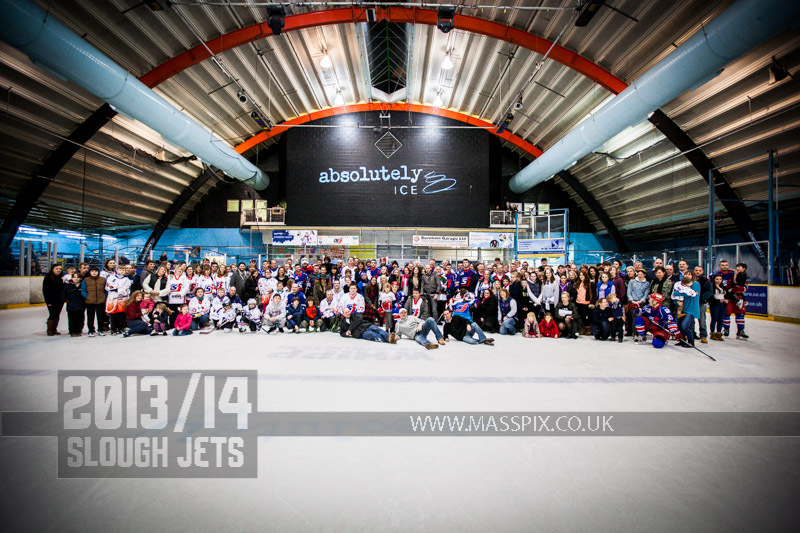 Slough Jets journeyed to Telford to face the Tigers for the final time in the season. Having been defeated the night before Telford came out hard in the first period and to ensure a scoreless end to an end to end period both netminders played well saving 21 shots in total. Slough got the scoring underway when Doug Sheppard found the back of the net at 27.54 which started a trading of goals through the next 12.06 remaining in the period. Joe Henry scored for Telford at 28.21 and despite Adam Calder giving the visitors the lead back at 38.39 Henry’s second at 38.39 ensured the second interval was taken level at 2-2. Telford took the lead for the first time in the game at 44.13 when Juraj Senko scored and 3.40 later Scott McKenzie made it 4-2. It took Slough just 21 seconds for Darius Pliskauskas to score to pull the game back to a single goal difference. With Connon collecting a delay of the game penalty at 58.00 Doug Sheppard called the Slough time-out and despite a period of empty net for 40 seconds Telford hung on for their victory and a reverse of the previous night’s result. Slough travelled to Telford still with an under-strength team to take on the Tigers. Slough raced away with the game in the opening twenty minutes as they swept their opponents aside and chased starting netminder Martin Clarkson from the net with a 50% save percentage. Shaun Thompson scored first a 3.07 and Doug Sheppard doubled the lead at 6.45. Adam Calder extended the lead to 0-3 and when Shaun Thompson scored his second at 13.04 Declan Ryan took over in the Telford net. The second period saw eight goals scored, four each. Joe Henry scored at 20.57 with a shorthanded goal before Shaun Thompson completed his hat-trick converting the same powerplay at 21.23. Sheppard netted his second at 22.21 to make it 1-6 before Daniel Mackriel netted at 23.28 and 24.25. Joe Greener continued the visitors scoring at 24.37 and Calder netted a shorthanded goal at 30.35 but the last goal of the period came from Adam Taylor. Slough finished off the game with two more unanswered goals in the third period from Dan Davies at 45.15 and from Michael Bowman at 50.10 and the short strength visitors completed a four point weekend. With Milton Keynes wrapping up the EPL title the previous night Slough lined up to offer their congratulations as the visitors took to the ice for tonight’s game. The visitors rested players and iced back up netminder Alex Mettam and Slough set about inflicting a crushing defeat dominating the whole game. Michael Bowman scored at 4.50, Paddy Ward converted a powerplay at 9.24 and Slava Koulikov scored his first at 10.27 to take the first period 3-0. The middle period continued in the same way as the first as Slough pressed home the goals. Ryan Watt netted at 27.42 with a powerplay strike and Blaz Emersic scored at 31.2 back at even strength. Carl Thompson was next on the scoresheet with his strike at 32.41 and Koulikov scored his second with 3.23 remaining in the period. Slough continued to roll the goals in the final period getting to 10 before Milton Keynes managed their only strike. Thompson netted a second at 48.47 to get the period scoring underway and Emersic soon followed with his second at 50.35 Koulikov got his hat-trick at 52.42 before Jacob Herin broke the shut-out at 56.35 but Dan Davies ensured Slough finished the scoring with his 57.35 goal.